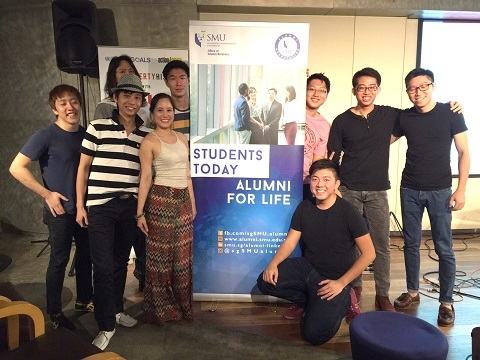 The SoundFoundry Alumni Group is formed by passionate and experienced ex-members of Singapore Management University's SoundFoundry. Our mission is to provide SF musicians the opportunity to continue pursuing music and perform even after they have graduated. We aim to provide our clients with a full and comprehensive package of quality music and sound for any gig needs you might need. The bands in SoundFoundry Alumni are specially handpicked and only selected through a long and careful process. These bands have years of experience behind them - having performed both in SMU and external gigs, up till this day. They represent the best of what SoundFoundry has to offer. Apart from offering performance-ready bands, we also offer comprehensive services that includes audio technical support. Our partnering sound company provides professional sound crews and tech to suit your needs. The SMU Office of Alumni Relation speaks to SoundFoundry Alumni Group President Yang Chuanrui to find out more about the formation and mission of the Group. 1) How did you get your fellow alumni to come together to form the SoundFoundry Alumni Group? How big is the Group currently? The group is basically made up of past SoundFoundry members, brought together with our strong passion for music, be it in performing or simply the enjoyment of music. Most, if not all, of the SF Alumni have performed in numerous events throughout their four years in SMU. The SoundFoundry Alumni Group serves as a platform not only for us to meet and catch up on old times, but also as an avenue for us to continue making music and performing even after graduation. Currently 30 members strong, we expect this number to increase over the years. They make up our bands, the alumni group’s management team and members who simply want to meet and make music together! 2) How can alumni get their bands to be listed as part of the Group? What is the criteria? The bands would have been formed and have gained experience throughout their four years in SMU. In our effort to ensure quality, these bands will only be invited to join the SoundFoundry Alumni Group as one of our bands if the alumni group’s management team deems them to be of decent performance standard. For those that do not make the list, they will also be encouraged to improve through other activities held by our group such as open mic jam events. We currently have six bands waiting and ready to perform, and the numbers will only grow over the years! 3) Since its formation, what gigs have the Group been involved in? Any upcoming gigs? We’ve just only formed, and have performed for events held by the Office of Alumni Relations ranging from awards ceremonies to charity and reunion events for graduates. We have also recently performed at the opening of Tonic-X! Our bands aim to enhance the overall atmosphere at every event, delivering their best performance while maintaining their professionalism, and most importantly making sure our audiences have a great time. Our bands are currently open available for gigs upon request! 4) Any vision or future plans for the Alumni Group? Apart from creating and maintaining a community of musicians that is the SoundFoundry Alumni, the Alumni Group’s management team have also introduced artiste and client management services as part of the Alumni Group’s core activities. Our team aims to provide a comprehensive performance package, in which not only will we be providing the best bands SMU has to offer, we will also be managing the sound and technical requirements for our clients at no cost. In a bigger picture, all the efforts the alumni have put in thus far is with the vision that all our members can stay connected to a community driven by a common passion for music, and that all our bands are able to continue performing even after graduation. You may find our website at bit.ly/smusfalumni for details on how to engage us, and also to view some of our band’s music videos!